Fast response EGT probe with yellow spade connector. The Depth adjustable probe and is super fast responsive! Braided stainless cabling. 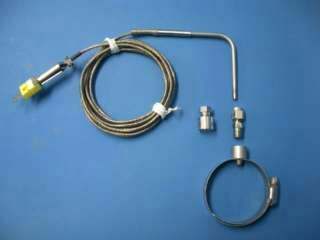 Also comes with a clamp, weld on fitting, screw on fitting, and a plug! This supports all the mounting options! 84" long with RFI noise shielding bult in. This is by far the best probe in the industry.